When trying to setup a new Virtual Machine, you could take the tough approach and do it from scratch. Or you could let someone else do the hard work for you and download a pre-built image. For VMWare, the place to do this is the VMWare Applicance Marketplace. 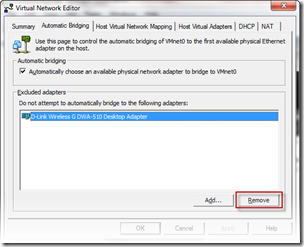 You should see your Wi-Fi adapter listed in the “Do not attempt to bridge” list. Select the adapter and hit Remove. Now try rebooting the Virtual Machine and see if Internet access has started working. I’ve shared a folder from the Host PC, but the Linux Virtual Machine can’t see it. If the lsmod command returns some output now, you’re all set to start copying-and-pasting files between the Host PC and your Virtual Machine. 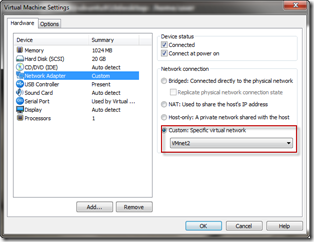 2 Responses to "Using VMWare Workstation – a couple of Tips"
Out of curiosity, why VMWare? For personal/desktop virtualization, I’ve found VirtualBox to be much more simple & efficient. I was using VMWare as a way to run a Mac OSX client initially and didn’t see any need to switch when I started adding more VMs. VirtualBox does look interesting (especially since Seamless mode & host-client copy+paste are supported), but info on the migration path from VMWare to VirtualBox on Windows is very sketchy and that does not fill me with confidence.